One of our favorite summer eats are a hearty loaf of bread, a bottle (or two!) of wine and some freshly made Tapenades and Bruschettas. We can sit on the back porch and enjoy a simple evening meal that transports us to far away lands, dreaming of vineyards and olive groves. Some cool jazz playing in the background and a fire in the pit makes for a magical summer evening. This year we have had an amazing tomato garden with handfuls of fresh beauties daily. They are sweet and plump, some red and some yellow and absolutely delicious right off the vine. We can hardly get them all inside and washed before eating them. With some fresh snipped basil and olive oil they are transformed into a delicious, refreshing bruschetta. Our dear friends Sarah and Charles own Old Mill Wine & Spirits, a fabulous wine and liquor store in the town of Rhinebeck, NY (the same place Chelsea Clinton is getting married this very weekend!). They are both gourmands with incredible knowledge and passion and have graciously shared with us some of their favorite recipes. We spent yesterday making some of their amazing tapenades and bruschettas to share with you here. Be sure to “Like” them on Facebook. 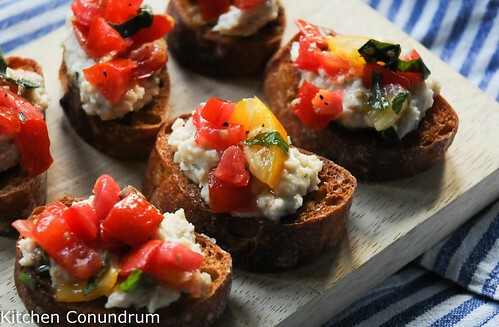 The first recipe is a Bruschetta made with white beans. It’s delicious alone on toasted baguette rounds or as a base for the Tomato Bruschetta. Drain and rinse beans with cold water. 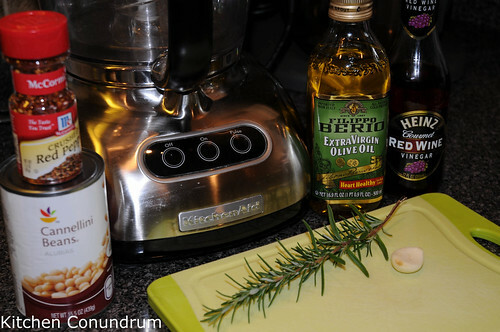 In a food processor, combine beans, garlic, rosemary, 1/4 cup of olive oil, vinegar, red pepper, salt and pepper. Pulse the mixture into a coarse puree. Set aside. 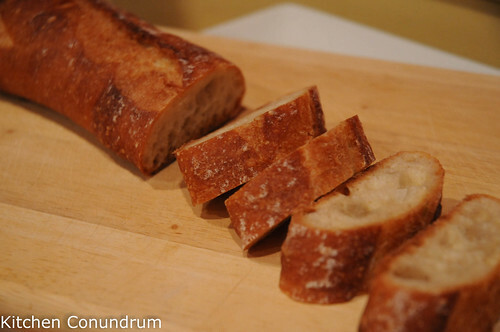 Slice bread into ½” rounds and brush lightly with olive oil on one side. Broil until slightly toasted. Spread with the bean puree and serve. Another wonderful variation is made with mushrooms. 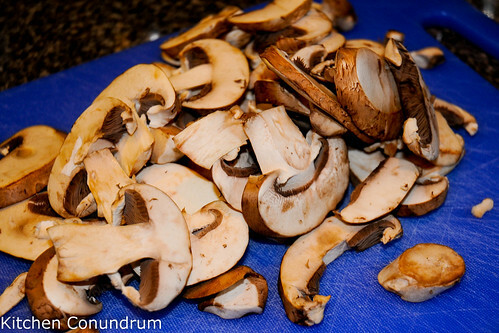 Wash and dry mushrooms, then chop very fine. Heat 3 tbsp olive oil in a large skillet over medium heat. Finely chop 2 garlic cloves and add to the oil. Saute until garlic turns golden, then add mushrooms and thyme leaves. Saute until mushrooms have reduced and liquid has evaporated, about 5-6 minutes. Add the lemon juice, salt and pepper and stir until dry. Slice the bread and brush with the remaining olive oil. Broil or grill both sides of bread until well toasted. Cut the remaining garlic cloves in half and rub toasted bread with the cut side of the clove. Spread mushroom mixture onto toasts and serve. And now for the classic! 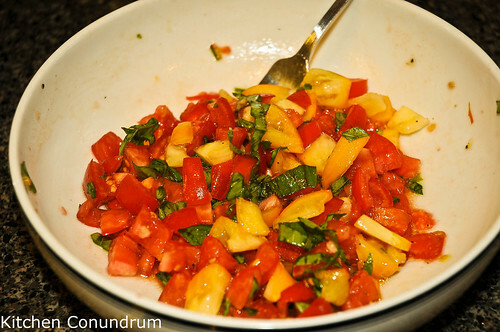 If you are lucky enough to have your own home grown tomatoes and basil, then you will be even happier eating your bounty with great, simple recipe. Preheat broiler to high. Slice bread into ½” pieces and drizzle lightly with olive oil on one side. Toast lightly on both sides, being careful not to burn. (*Can also be grilled for extra flavor.) Slice garlic cloves in half and rub one side of the toasted bread with the cut garlic. Quarter tomatoes and remove all pulp and seeds. Chop fine. 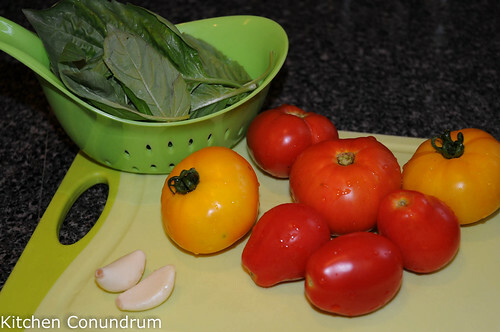 Slice basil leaves into small pieces and add to tomatoes. Add remaining olive oil, salt and pepper to taste and toss to coat. Spoon onto toasts and serve. If bruschettas are not enough, you can also make these delicious olive tapenades. We love to make combinations with the bruschettas and the tapenades, layering each flavor on top of the toasted breads. 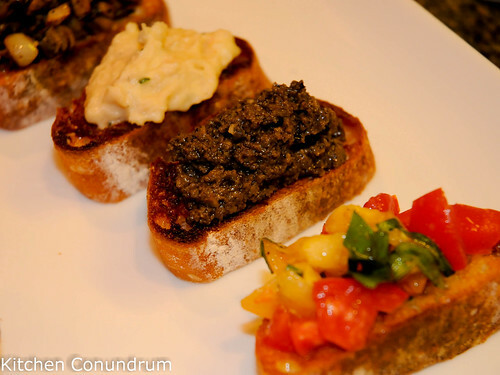 The Black Olive-Lemon Tapenade is divine topped with the tomato bruschetta, the flavors, bright and fresh. You can also use these tapenades mixed into salad dressings or pasta. Place olives, garlic and anchovies in food processor and pulse until coarsely ground. Add olive oil, herbs, lemon and pepper and process to a fairly smooth puree. Place olives, garlic and capers in food processor and pulse until coarsely ground. Add olive oil, basil, parsley leaves and pepper and process to a fairly smooth puree. If you are like us, you will make them all and when you are done, you will have an array of tasty delights to top your bread. Pair with a bottle of Cotes du Rhone Rose and enjoy! These look fantastic! I really want to make the white bean one!! I must say that the white bean called out to me too! They all look amazing though, and I agree that there could be no better way to spend a summer evening. 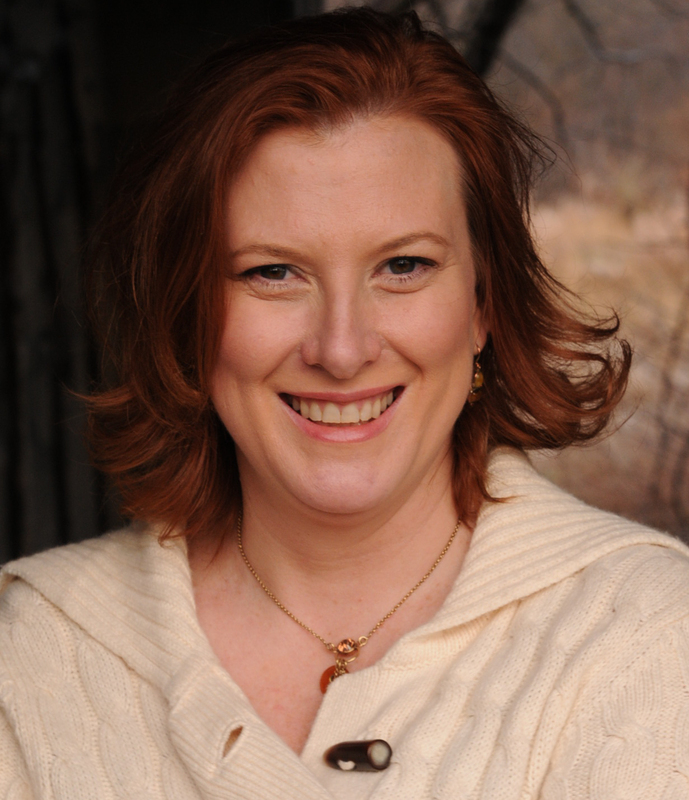 Thank you for another lovely post! These look fabulous, can’t wait to try them. I just noticed that you make cooking look much easier than I make it out to be. Lovely little bites! It all looks incredible! These look delicious! My mouth is watering at the sight of them! Thanks for sharing the recipes.